I am beginning to sound like a broken record, but all the shells I found were occupied by hermit crabs, so the best I could do was get some photos. While traveling the backwaters of the Indian River, we came up behind the islands known as Three Sisters. Since I love to walk along the sandy flats when the tide is out, my son dropped me off and he went out fishing. I found so many interesting shells in this area that I went back out to the boat to get my camera. Here’s what I found in this marvelous area of Florida which is mostly untouched by man. A pretty little yellow Pear Whelk shell. 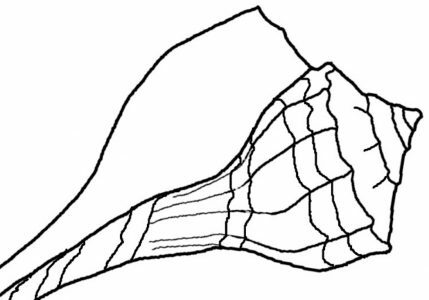 It is similar in looks to the Lightning whelk (second photo), but the opening is on the right, not the left, as in the Lightning whelk. This crown conch is not an unusual find, but I did like the nice size of it’s spikes. Often the spikes can be worn down from all the tumbling about in the ocean, but these spikes were long and sharp. Had to get a photo before the crab inside scampered away. I wasn’t too sure what this little gray shell was, but I think it’s a faded pear whelk. It’s my best guess. And here’s a real beauty… Yes, this is a seashell. It’s round, and mud covered, but it’s one of my favorite shells. Any guesses? Click to see a good photo of the Shark’s Eye shell. And my favorite find of the day was this awesome big True Tulip shell. My book says max 5 inches for this one, but this one is more like 6 inches. It has a broken opening with an oyster attached to the inside, and of course, a hermit crab has taken up residence. All these shells and many many more were living in close proximity on this sandy bottom surrounded by oyster beds. Shells could be seen scurrying along just under the water at low tide, but the crab would stop and hide once I approached. They tuck themselves all the way up inside these shells, so it looks unoccupied, but I know better. Previous Post Found a Big Living Horse Conch, Exciting!